Pictured, from left to right: Andy Nakajima, Barry Bandstra, Roger Nemeth, Sonja Trent-Brown, Deirdre Johnston, Tracey Nally, Aaron Putzke and Billy Mayer. The luncheon traditionally marks the beginning of the college’s second semester. Participating were James Bultman, president; Richard Ray, provost; Alfredo Gonzales, associate provost and dean for international and multicultural education; William Reynolds, dean for the arts and humanities; Kelly Jacobsma, who is the Genevra Thome Begg Director of Libraries with the rank of associate professor; and Lorna Hernandez Jarvis, who is professor of psychology and director of general education and interdisciplinary studies. Honored for 45 years of service was David Myers (psychology). Recognized for 40 years of service were Jane Dickie (psychology), Stephen Hemenway (English) and Richard Smith (theatre). Honored for 35 years of service were Tom Ludwig (psychology) and Don Luidens (sociology and social work). Recognized for 30 years of service were Herb Martin (accountancy), Richard Ray (provost) and Boyd Wilson (religion). Honored for 25 years of service were Tony Donk (education), Mike Jipping (computer science), Perry Landes (theatre) and Pat Roehling (psychology). Honored for 20 years of service were Maria Burnatowska-Hledin (biology and chemistry), Mihai Craioveanu (music), Annie Dandavati (political science), Lee Forester (German) and Steve Hoogerwerf (religion). Recognized for 25 years of service as an adjunct or part-time faculty member was Linda Booker (dance). Named a “Towsley Research Scholar” was Aaron Putzke (biology). The “Janet L. Andersen Excellence in Teaching Awards” were presented to Billy Mayer (art) and Sonja Trent-Brown (psychology). The “Ruth and John Reed Faculty Achievement Awards” were presented to Andy Nakajima (Japanese) and Roger Nemeth (sociology). The “Academic Computing Advisory Team (ACAT) Innovation Award” was presented to Barry Bandstra (religion). The “Provost’s Awards for Service to the Academic Program” were presented to Deirdre Johnston (communication) and Tracey Nally (sponsored research programs). Faculty honored for serving on the college’s Teaching Enhancement Workshop Committee or as presenters in the program were: Debra Swanson (sociology, and committee director); Christopher Barney (biology); Maura Reynolds (Latin, and director of advising); Jeff Tyler (religion); and Scott VanderStoep (psychology). Heather Sellers (English) was recognized for having received the 2011 Hope Outstanding Professor Educator (H.O.P.E.) Award. Acknowledged as authors and editors during the past year were: Isolde Anderson (communication), Claudine André (Spanish), Albert Bell (history), Steven Bouma-Prediger (religion), Wayne Brouwer (religion), Elton Bruins (A.C. Van Raalte Institute, and religion, emeritus), Susanna Childress (English), David Cho (English), Liliana Dorado (Spanish), Jim Herrick (communication), Teresa Housel (communication), David “D.R.” James (English), John Lunn (economics), David Myers (psychology), Laura Pardo (education), Richard Ray (provost), Jack Ridl (English, emeritus), Peter Schakel (English), John Shaughnessy (psychology) and Todd Steen (economics). Honored for accomplishment as performing artists were: Jean Bahle (theatre), Mihai Craioveanu (music), Edye Evans Hyde (music), Daina Robins (theatre), Gabe Southard (music), Steve Talaga (music) and John Tammi (theatre). Recognized for their work as artists were Bruce McCombs (art) and Stephanie Milanowski (art). Members of the kinesiology faculty and staff honored for accomplishments as coaches were: Kevin Cole (men’s track and field), Bob Ebels (men’s golf), Brian Morehouse (women’s basketball), Matt Neil (men’s basketball) and Mark Northuis (women’s cross country). Faculty honored for being named officers of professional associations were: Leah Chase (biology and chemistry), Stephanie Edwards (mathematics), Jonathan Hagood (history), John Lunn (economics), William Pannapacker (English), Graham Peaslee (chemistry, and geological and environmental sciences) and Richard Ray (provost). Faculty and other members of the campus community recognized for receiving honors and awards were: Jeff Brown (engineering), Maxine DeBruyn (dance, emerita), Meg Frens (kinesiology), Tonia Gruppen (kinesiology), Yooyeun Hwang (education), Stacy Jackson (management), Anne Larsen (French), David Myers (psychology), Graham Peaslee (chemistry, and geological and environmental sciences), Heather Sellers (English), Deborah VanDuinen (education), Charlotte vanOyen-Witvliet (psychology), Melissa Villarreal (sociology and social work) and Barbara Vincensi (nursing). In addition, the Van Wylen Library was recognized for having received a 2011 Citation of Excellence from the Library of Michigan Foundation for the exceptional customer service provided by the library staff. 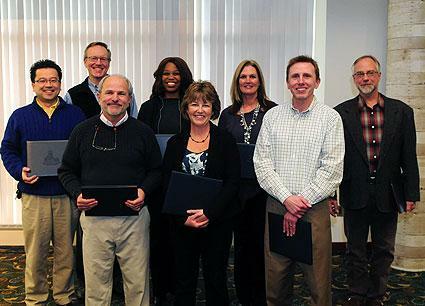 Several faculty and staff were recognized as recipients of grants and fellowships: Beth Anderson (chemistry), Isolde Anderson (communication), Barry Bandstra (religion), Brian Bodenbender (geological and environmental sciences), Michelle Bombe (theatre), Steve Bouma-Prediger (religion), Kenneth Brown (chemistry), Tom Bultman (biology), Andrew Dell’Olio (philosophy), Suzanne DeVries-Zimmerman (geological and environmental sciences), Tony Donk (education), Liliana Dorado (Spanish), Eva Folkert (kinesiology), Lee Forester (German), Greg Fraley (biology), Curtis Gruenler (English), Virgil Gulker (Center for Faithful Leadership), Jonathan Hagood (history), Jennifer Hampton (physics), Ed Hansen (geological and environmental sciences), Vicki-Lynn Holmes (education and mathematics), Mary Inman (psychology), Kelly Jacobsma (Van Wylen Library), Michael Jipping (computer science), Jeff Johnson (chemistry), Deirdre Johnston (communication), David Klooster (English), Brent Krueger (chemistry), John Krupczak (engineering), Don Luidens (sociology), Virginia McDonough (biology), Ryan McFall (computer science), Roger Nemeth (sociology), Jacob Nyenhuis (A.C. Van Raalte Institute, and provost, emeritus), William Pannapacker (English), Mark Pearson (mathematics), Graham Peaslee (chemistry, and geological and environmental sciences), Anthony Perovich (philosophy), Julia Randel (music), William Reynolds (dean for the arts and humanities), Caroline Simon (interim dean for the social sciences), Darin Stephenson (mathematics), Debra Swanson (sociology), Steve VanderVeen (Center for Faithful Leadership), Kathy Winnett-Murray (biology), Daniel Woolsey (Spanish) and Brian Yurk (mathematics). In addition, the event commemorated that Hope received the most National Science Foundation grants and dollars in the state of Michigan for an undergraduate school with nine awards totaling more than $1.1 million.